The game that was so good it made it onto TWO Your Sinclair cover tapes due to reader demand. I don’t know, you get a game for free, break the tape through playing it so much, and expect the magazine to provide it free AGAIN? Well, they did. One of the simplest games graphically, the depth of play speaks for itself. I’m sorry, but really, I don’t think my feeble words on this page can do the game justice. However, in the interests of actually writing some content for this site, I shall try. Chaos, then. Wow. A game for 2-8 players, some or all of which can be computer controlled at a variety of skill levels. A choice of 8 styles and 8 colours of wizard allow you to identify your mage from your enemy with ease. The game takes the form of turn-based strategy, each player gets the opportunity to view their spells, choose a spell and examine the game board. The spells you can choose from range from creature spells (all with different chances of success), weapon spells (improve your wizard’s attack and movement capabilities), spells that affect the balance of the universe (each spell cast affects the universe somewhat, but the Law and Chaos spells can increase the likelihood of successfully casting the more deadly creatures much quicker), odd spells that can create forests or castles, and the always available “Disbelieve” spell. Once all players have chosen their spell for that turn, we enter the “casting” phase. Here, each wizard takes their turn to cast their spell. Some will succeed and some will fail, all dependant on the casting chance of each particular spell. Once all players have completed casting, we enter the movement phase. Each player now takes a turn to move all their creatures and their wizard. Most creatures can move but one space, but some (especially the flying creatures) can move several, and some have ranged attack. Each creature and wizard has their own set of statistics… Attack & Defence and Magic Resistance for example, and it’s these statistics that can affect the outcome of each skirmish. 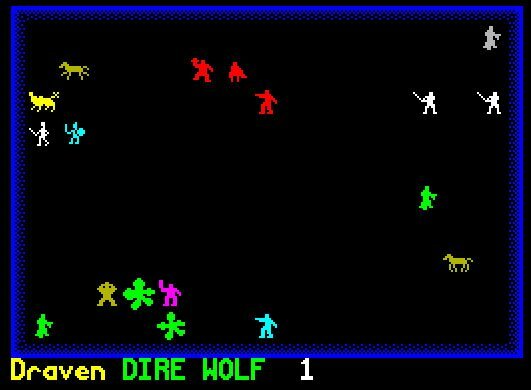 Ranging from the poor Giant Rat (Combat 1, Defence 1) to the ultimate Golden Dragon (Attack 9, Defence 9), each creature has the chance to move and attack each other. Of course, the standard laws of fantasy battles apply, undead creatures cannot be harmed by non-undead creatures or weapons, but can still engage an enemy, magic weapons can destroy any creature, and some creatures can be mounted by the wizard for both added range and protection. Generally, the worse the creature is in battle, the easier it is to cast. Giant Rats, for example, are always 100% casting chance. The Golden Dragon starts at 10%, but if the universe shifts towards Law as a result of the spells that are cast, the chance can actually increase to 100% (Chaos based creatures, however, become LESS likely). When choosing a creature spell, you also have the option to cast the creature as an illusion. Whilst this automatically means the creature cast WILL succeed, it can also be destroyed in an instant by the “Disbelieve” spell, which can reach anywhere on the board. As a result, you might only get one turn with the creature, so it’s worth keeping hold of those high-risk creatures for a time where you might get a chance to do lots of damage in just one turn. In comparison, you can send out a risky bit of Magic Fire, or a Gooey Blob, both of which will spread randomly around the board, devouring creatures that are unlucky enough to get in the way. Walls can be cast to provide some extra cover from creatures and ranged weapons, and wizards can hide inside a castle or citadel, which will crumble after a certain length of time. Shadow Wood provides you with a forest of trees that can attack enemy creatures, Magic Wood provides a wizard with cover, and also enable you to pick up extra spells, including the ultra-rare Turmoil spell, which moves EVERYTHING around the board, causing ultra chaos in the process. Your wizard can improve his abilities and attack potential through spells like Shadow Form and Magic weapons like Magic Bow. He can also unleash unholy fury on an enemy with a swift Magic Bolt, or Lightning. He can resurrect the body of a fallen creature, enemy or ally, opening the possibility of an undead Golden Dragon… but beware, it could always fall under a spell of Subversion, resulting in another wizard gaining control of your unholy behemoth. Or, the final set of spells, which are the real nasties. Nothing is worse than having a veritable army of dangerous creatures and having a serious advantage over the opposition in the late stages of the match, only to be attacked by one of the Dark Power, Vengeance, Justice or whatever the other one’s called. Each of these has the ability to destroy a single creature anywhere on the board, illusion or not, but used on a Wizard, if successful, all creations can be lost in an instant, shifting the advantage somewhat. 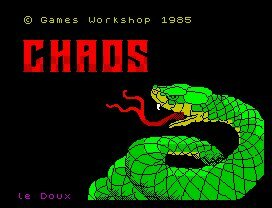 So there it is, the ultimate classic game on the Spectrum, simple in concept, big on gameplay, big on multiplayer fun and big on still being playable almost 20 years later. What more could anyone ask for in a game?